Finished the game today after a major marathon and it was awesome. So I never actually knew what DanganRonpa was before its announcement for the West. I only knew they were games that were released a while back on PSP and I knew fans loved the series. I also knew about the anime for this game but I never checked it out. I remember checking out some of the artwork online a few years ago though. But all I heard from fans who recommended it was that it's like 999 and Ace Attorney and I was sold. But after finishing it, I feel it's much more than that. So do you like the Zero Escape series? How about the Persona series? Or how about the Ace Attorney series? Ever wondered what would happen if someone combined them together? It would be DanganRonpa, yo! The story was simply incredible. It was full of twists and unexpected moments. You play as one character who is trapped in some weird school and must work with a cast of characters to escape. I won't get into details but there are also trials where you must win to survive. The main plot was simply riveting from beginning to end. What really grabbed me was how much risk it took with its characters and setting. You just never seem to know what will happen next. The game plays around with your expectations all the time. Even when I figured out who the suspect was or how someone was murdered, the game would throw in multiple curve balls to screw with you. It was a lot of fun and kept me entertained. I never got bored with any part of the game. I was sucked into its crazy world. Some of the things that happened was incredibly morbid and disturbing. It definitely made me felt uneasy at times. There is a lot of dark humor that some people will enjoy. When the game wanted to be funny, it was funny. When it wanted to creep you out, it was pretty darn creepy. So good. The characters were incredibly diverse and fun. They took your typical archetypes and totally messed around with them. I was continually surprised at how well developed and written they were. Most of them weren't what you'd expect from how they looked. Although, there was one stereotypical geek/otaku/nerd fat guy who encompassed all the negative sides of that trope. At least he wasn't dumb, sorta. But anyways, I really liked most of the cast. Most of them were very smart and very clever. In fact, some of them are even smarter than your character which was refreshing. I need to point out that it was very bold of NIS America for them to keep the original Japanese names. They could have gone the other way and made up English names but they didn't. I liked that. The dialogue between the characters were very well written. I have to give NIS America HUGE props for the localization. I was super duper impressed! The dialogue was extremely natural and flowed really well. It felt like how people would speak in real life if they were put in these situations. Even the jokes were super well written. The lewd jokes in particular were funny as hell. I'm not sure who was in charge of them but they were biting and insanely well timed. Hell, even the cursing felt right for whoever was saying it in their situations. I laughed out loud quite often. I also liked the multiple references to other games and other forms of pop culture. Some are quite subtle while others blatantly mention specific product brands and/or names of real world people. It's a bit jarring when that happens but they don't date the game or make it feel awkward. If it weren't for the strong translation, I don't think I would've liked the game as much as I did. So once again, kudos to NISA for a job well done. There are several distinct aspects to the gameplay which I will quickly summarize. It contains some familiar aspects you would see from visual novel games but contains a lot of actual game in addition to simply talking to people. The first aspect is called "Free Time" where you go explore the school in first person mode and talk with any other students along the way. The game also allows you to fast travel to hot spots which made exploration a breeze whenever I had to backtrack to an area. You're given a specific amount of time to talk to students and get to know them. You can even give them presents you get from a vending machine to unlock skills you can use for the trials. I wish the game gave me more time to chat with more students in a day because people will die and when that happens, you can't talk to them anymore. The next part of the game is the "Investigation" mode where you must gather clues after a murder has taken place. You basically need to investigate crime scenes and other parts of the school to collect evidence and NPC testimony for "Truth Bullets" which are used during the trials. The game won't progress until you find all pertinent clues. What I really liked is if you checked out the information before the trial, you can actually figure out a lot of stuff from your own detective work. The third aspect is the trial itself. Characters start discussing the crime and you need to point out contradictions with your "Truth Bullets". You need to literally shoot text on screen with your own text by aiming or tapping. It's quite challenging especially later in the game because it can go crazy with the speed and placement of the words. This was a really fun aspect of the game because how much action is going on. There is also a "Bullet Time Battles" which pops up certain times where it becomes a music rhythm game. Huh, yes, it's true. I'll let you guys see what that's all about but it wasn't too hard and added another layer of gameplay to the trials which was fun. I also need to point out that the trials are 100% voiced unlike the main game which really added a lot to this part of the game. The final aspect is the "Closing Argument" where you must figure what happened in the entire case. You're given a comic book/manga where you have to put in missing panels that will reveal what happened. It's really fun because once you complete it, you see an animated comic/manga come to life and explain the case clearly and concisely. Very well done. I need to point out that once you beat the game, there are a lot of fun extras to check out. Hint: School Mode. The visuals are absolutely stunning all around. Both the 2D and 3D art are super colorful and sharp. The 2D character art in particular is gorgeous. The character designs themselves are very attractive and well defined. There are several art styles that pop up but they're all beautifully illustrated. They look particularly nice on the Vita's OLED screen. The character sprites don't have actual animations like with the Ace Attorney series but they are well drawn and very expressive. The event art (the painted scenes) is stunning and the occasional pixel art is cute as hell. The 3D parts of the school are also beautiful and very detailed. The FMV scenes are a mix of 2D/3D and really interesting. I really love the look of this game. The game even allowed me to remove the UI during gameplay so I could easily take screenshots which was a nice feature. Why can't more games do this? I also want to point out the gore in this game. The blood has been colored pink for some reason. I assume they were done to stylize the murder scenes or make it less gorey for anyone squeamish about blood in general. Personally, I think it took away some of the horror of the crime scenes. I wish there was a toggle for it. Just a minor gripe. The audio was equally outstanding as the art. I loved all the music in this game. The trials in particular had several tracks which pumped me up. Great soundtrack all around. I also need to point out the English dub. IT WAS AWESOME. Yea, I'm not even exaggerating, it's just that good. The voices felt shaky at first when I started the game but they only got better and better as the game progressed. I didn't really fall in love until the first trial where it was fully voiced and you could really admire their performances. Everyone matched their roles and they did a great job making all these characters come to life. They read their lines with gusto. If it weren't for them, I wouldn't have liked the characters as much as I did. I became a fan of several voice actors simply because of this game. There was one character that totally floored me with their performance in particular. I won't spoil who though. *grin* Once again, great job NIS America. 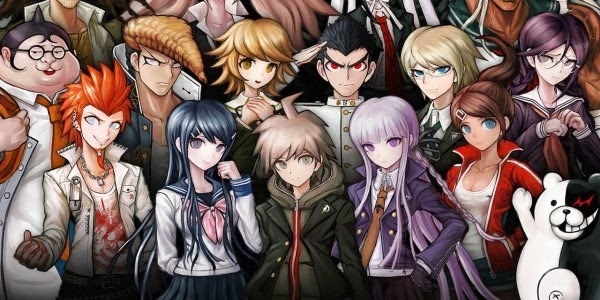 DanganRonpa exceeded my expectations even with all the hype from its fans. I loved every minute of it and was compelled to keep playing all the way to the end. Great writing, great story, great characters and great VO with fantastic art and music. It's a complete package and anyone who's into games like the Zero Escape and Ace Attorney series MUST play this. LOVED IT.